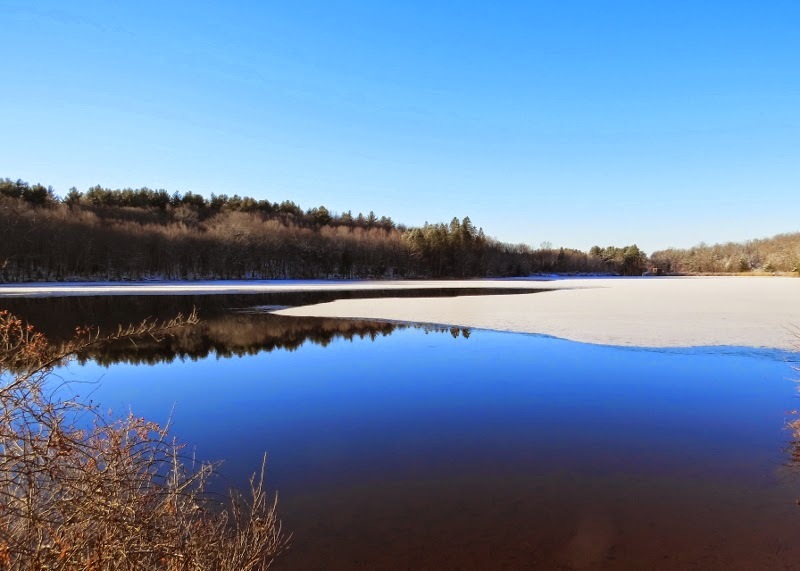 I visited Hanover pond in Meriden for the first time the day after Christmas. 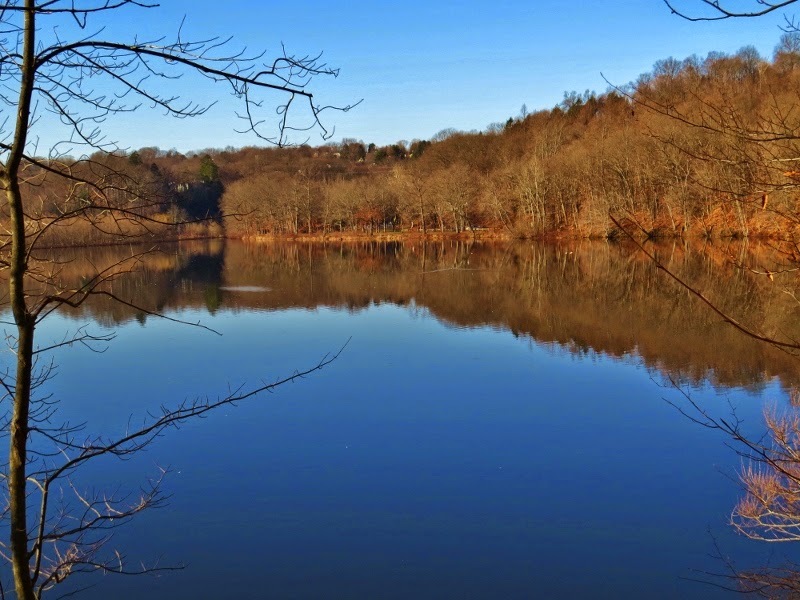 Much of Meriden is an urban area but they do have their share of hiking trails, ponds and birding areas. This is a photo of the undeveloped side of the pond. I've been curious about this particular area and when it was reported that Redheads were seen there I thought I would go look for them. It was the first time I've seen this species of duck. Their heads are round, puffy, and rufous (that word always sounds odd word to me). The black-tipped bluish bill was also noticeable. As I was watching the ducks a sharpie was watching my every move from the tree above me.Later in the day I also noticed a Bald Eagle perched in one of the trees. Interestingly, the ducks started swimming toward the other side of the pond when the eagle showed up. There was also plenty of Common and Hooded Mergansers (above) in the pond. On the other side of the pond was a parking area near a ball field. I tried to take photos of the birds over there but the goose in charge said no Paparazzi! 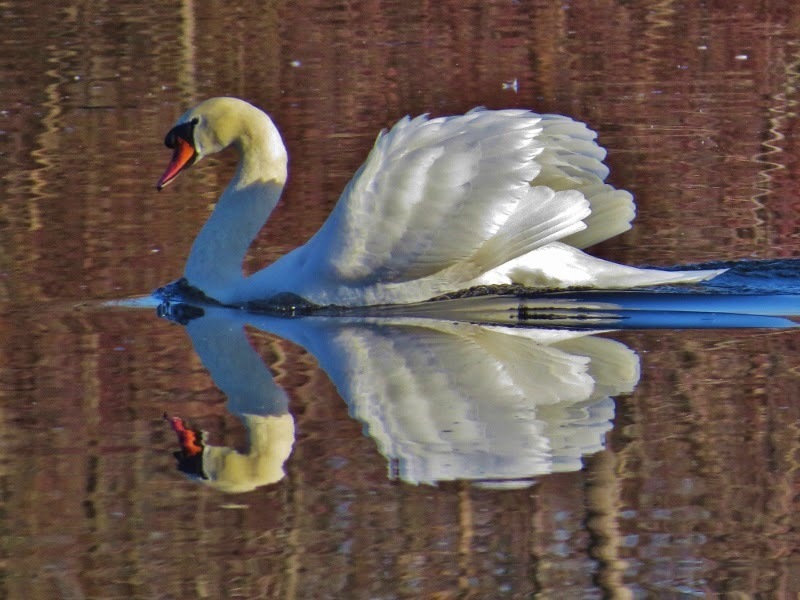 I like when swans display their feathers like this. It gives them a more elegant appearance. I'm looking forward to a return visit to explore some of the other trails in the same area. 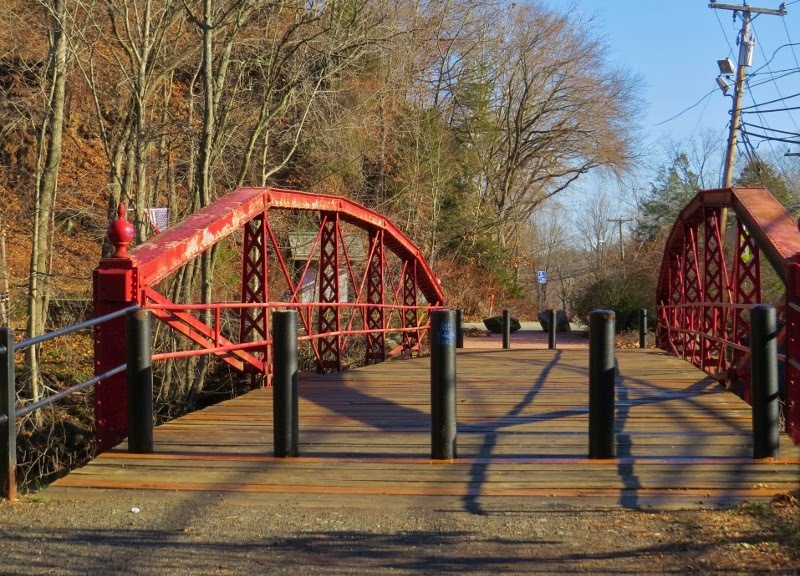 This historic red bridge leads to the linear trail which follows alongside the Quinnipiac River. 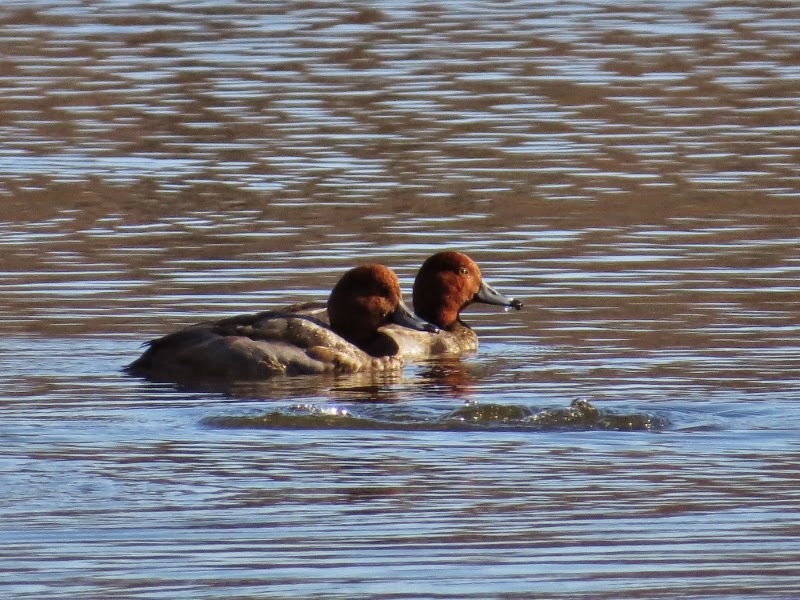 It's always nice when you come across a new local spot that is good for birding.The weather was great, there were lots of birds and I seeing the Redheads for the first time was like getting another Christmas present. I found this Snow Goose in a corn field near Lyman's orchard this morning and I must say that I am disappointed that those pesky elves would take things this far. 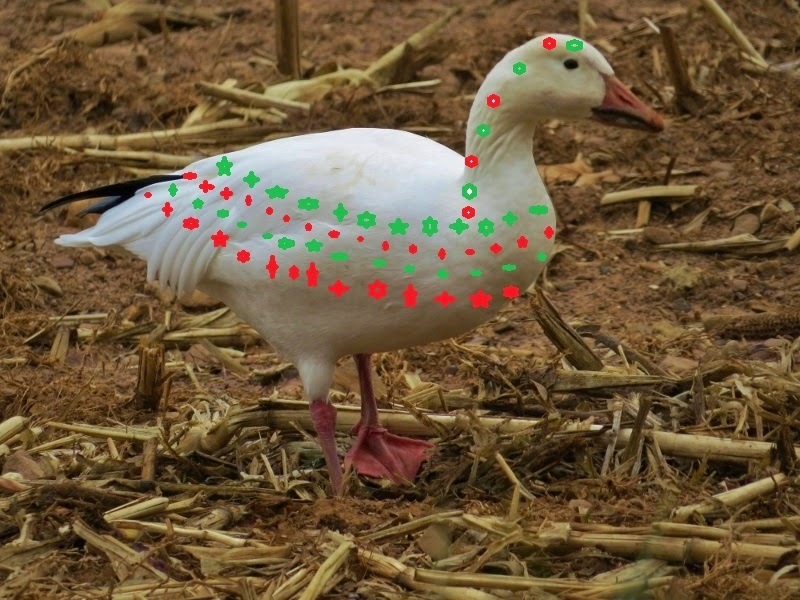 I can understand decorating Santa's reindeer but leave the poor Snow Geese alone! 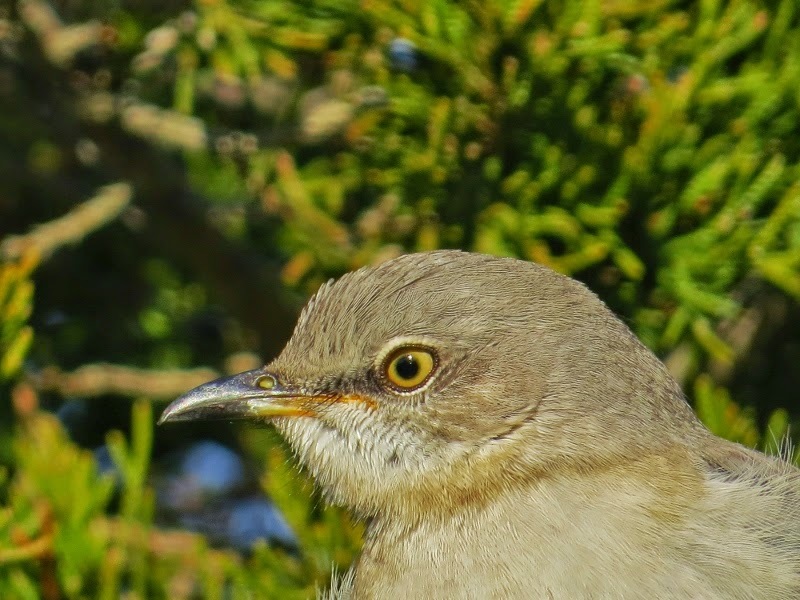 It's that time of year when the annual Christmas bird counts are taking place all around the northeast. Prior to 1900 it was tradition to shoot as many birds as possible. Counting them seems to be much more in the Christmas spirit. I participated in a local count over the weekend. The day before the count I started out early in the morning crossing the train tracks and heading down toward the river to start a dry run through the count circle territory. 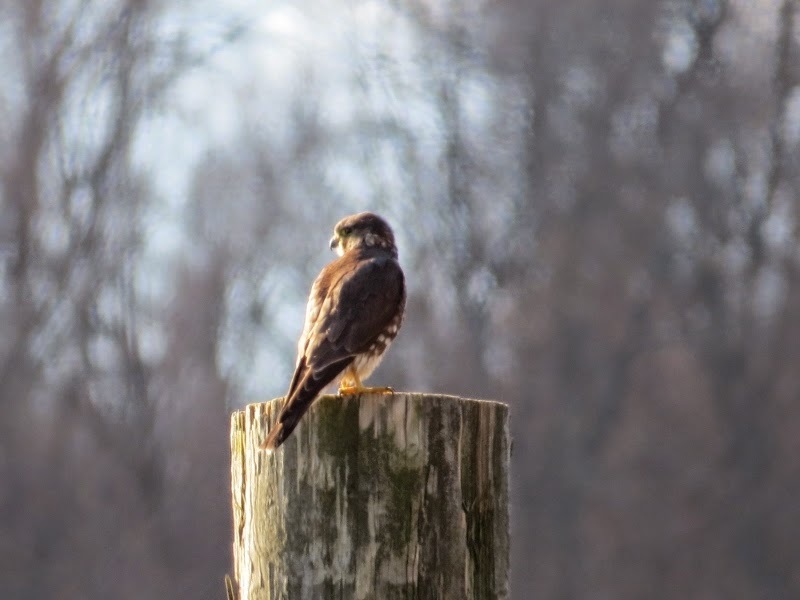 I found a Merlin on top of a wooden post out on the water. I believe it was just outside the count circle so I tried to signaling it to fly up river. While Santa decides who's naughty or nice I'm searching for ponds free of ice. On the day of the count some people are curious as they see us wandering through the neighborhood in search of birds. Some stop by to say hello or wish us luck. Others fill their bird feeders to help our efforts.Even the deer are curious about what we're doing. For me the Christmas count is not just about collecting data. 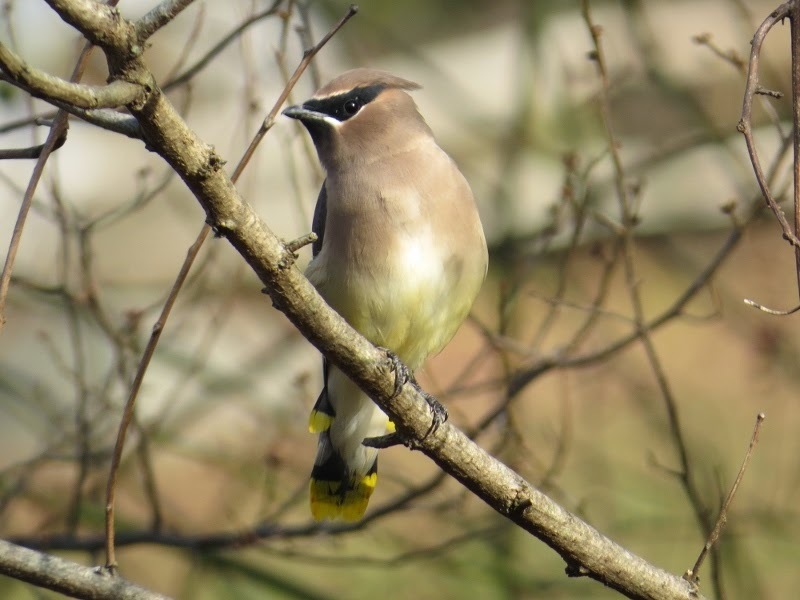 It is a way for birders to participate in a fun tradition around the holidays. It is also a reminder that all birds big and small are of great importance to us all. 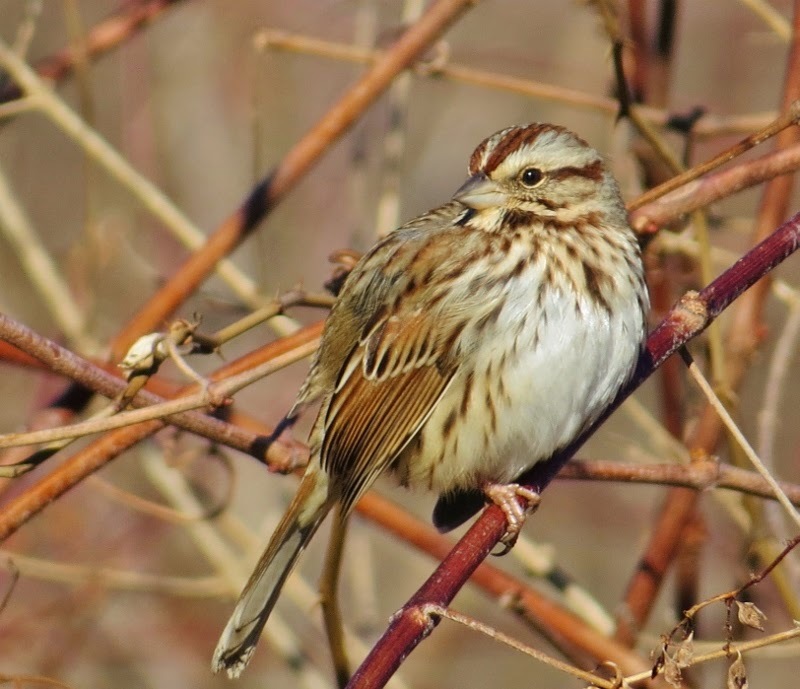 That includes Song Sparrows. There are many times when I'm out birdwatching that I here the question-"Have you seen any eagles?". Sometimes I'm just asked if I've seen any with the assumption that I must be looking for eagles. 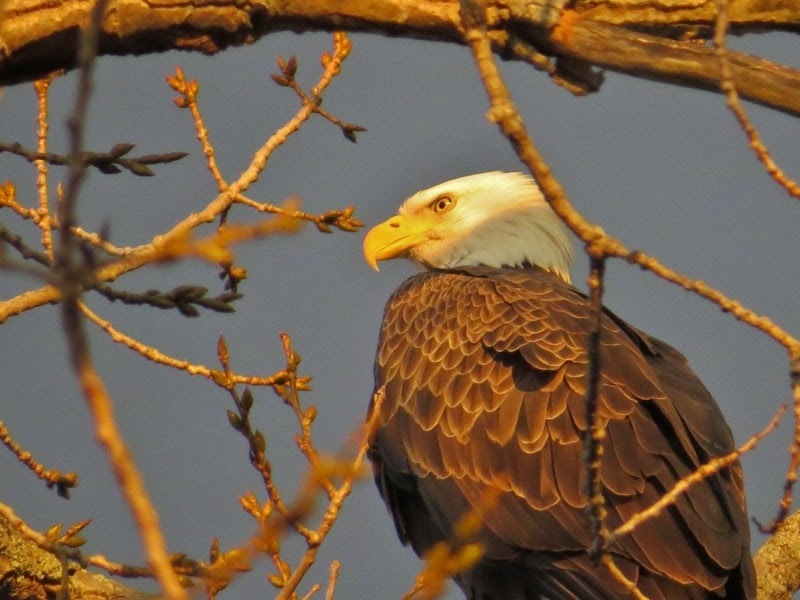 Every winter people in Connecticut who have little interest in birds beyond what they see at their feeders venture out on the weekends with their binoculars in search of Bald Eagles. It was over 10 years ago that I was doing the same thing. 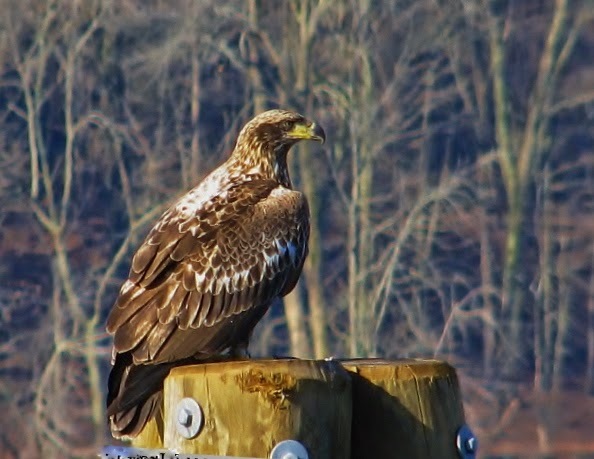 I was amazed by how many eagles could be found right here in Connecticut as they traveled down from the northern states in search of open water. 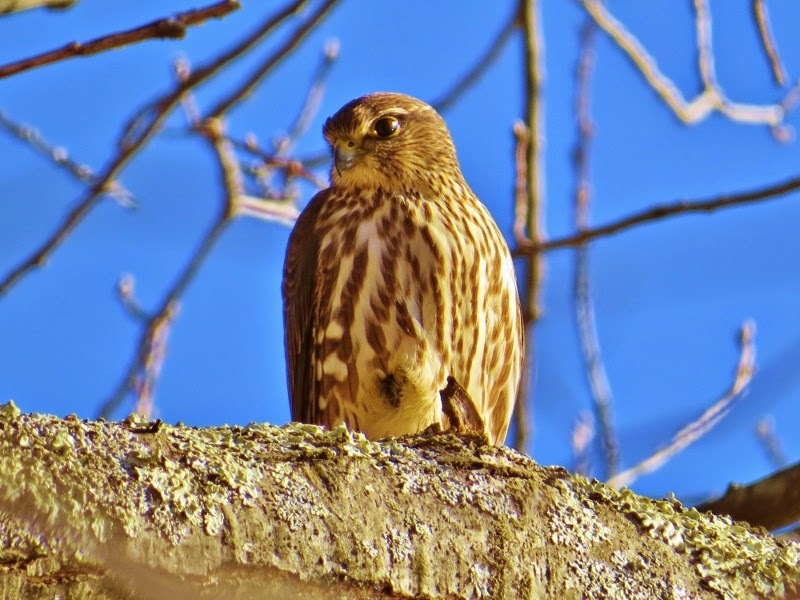 Now they regularly nest here and can be found along the Connecticut River year round. 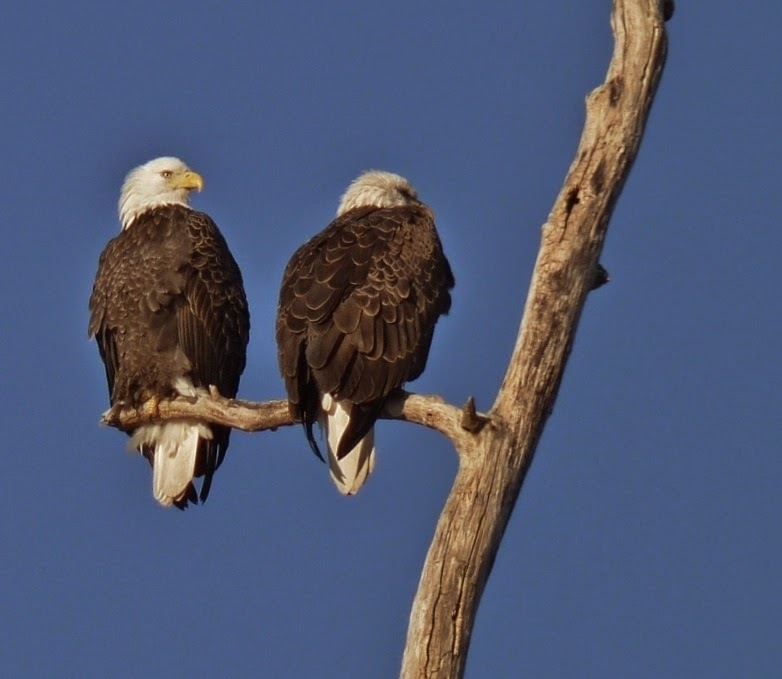 Once I saw my share of eagles I started to point my binoculars in the direction of other birds. That was the turning point when I went from someone who looks at birds to someone who actively seeks them out-(aka-a birder). 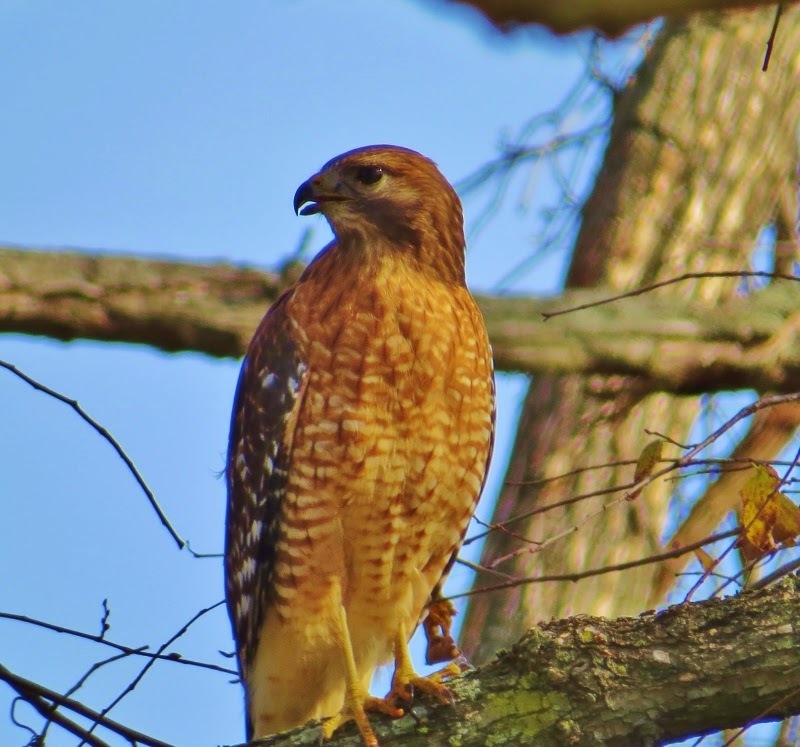 For some it may have been the sight of their first bluebird, oriole, owl, or Great Blue Heron that first lured them away from their backyard birdfeeder and into the local farm field with their binoculars but the eagle has got to be near the top of the list of birds that have served as a gateway to the world of birding. While I'm out birding at various places I often run into other people who strike up conversations with me (or vice versa) about birds or other aspects of nature. While we may not always share the same views, I can still appreciate listening to someone who is passionate about their interests. The following topics have some up over the years on more than one occasion. I've added a few personal thoughts and assigned a rating of 1-10 based on my level of interest in each topic.The higher the number the greater the interest. Preserved Land- 9 : I've probably spent hundreds of hours exploring Wangunk Meadows Wildlife Management Area (above) and get really fired up when I discover a new place that has land which has been set aside for preservation. What stops it from scoring a 10? Some of these protected lands turn out to be duds when it comes to birding action. Rare Birds-6 : I don't get overly excited about sightings of rare birds unless they are super rare, super interesting to look at, or I've never seen one before. My favorite part of driving out to see a reported rarity is that it is like a concert event for birders. It's fun to be a part of the scene. Native Plants- 5: I believe its a good idea to use native plants when landscape you backyard but I don't think the birds are always impressed. 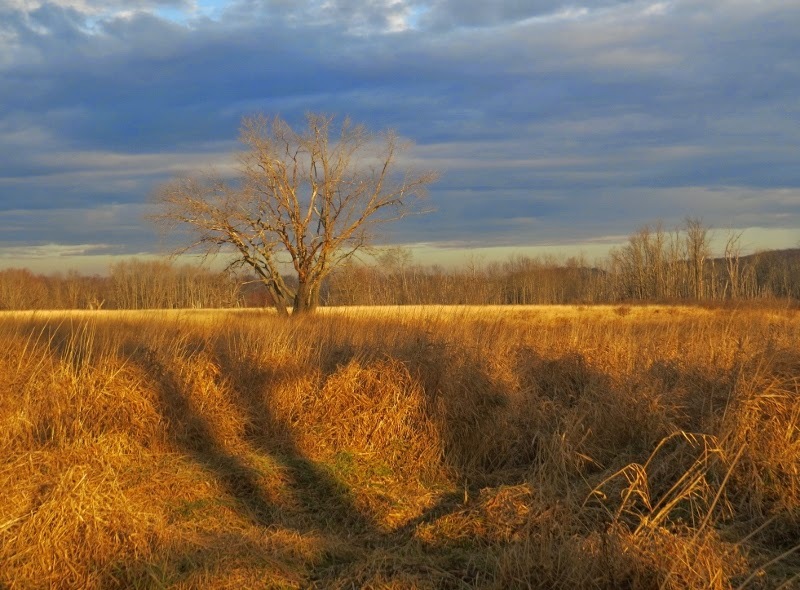 I visited one field on several occasions that has been cleaned out and replanted with a variety of native grasses. I've never seen any of the birds there that they were hoping to attract.Also, I've noticed that birds seem to eat the berries off of non-native plants just as much as the native ones. They don't care-they just want food! 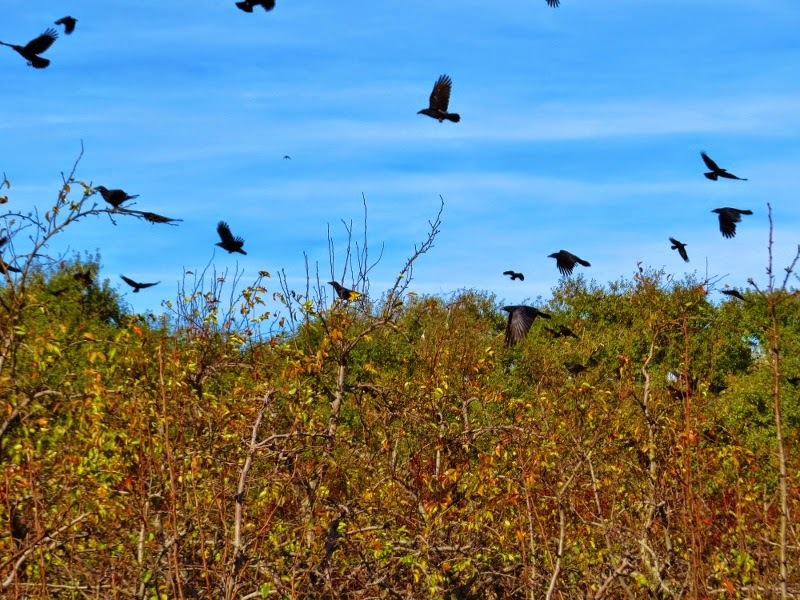 Unfortunately, birds eating everything also leads to the spreading of invasive plants. Invasive plants-7 : There's some nasty invasive plants out there that like to wrap their vines around trees or choke out other plants. I hate the chore of having to pull them up out of my backyard. it seems like a lost cause but I give thanks to those who go to park and preserves to try to clean them out. Introduced Birds-9: I don't understand why people get so worked up about species of birds that were brought here by us against without their consent. House Sparrows, European Starlings, Mute Swans etc. are here to stay unless nature decides otherwise so why stress about it? I guess the melting pot mentality does not extend to birds. I wonder if there would be a campaign to destroy House Sparrows if they looked and acted like bluebirds? Something to think about. Have you Seen Any Eagles?-7: This has been one of the most common questions that others ask me when they notice I'm carrying binoculars. Sometimes I get a little tired of the question. Then I remember a time when I rarely saw them so I am thankful that I can now see Bald Eagles almost every time I'm out birding in my area.There are a lot of people who aren't into birding that think eagles are cool so it's a good conversation starter. Species that are difficult to identify-4: I never liked piecing together the blue sky section of a puzzle and in the same way I don't like the challenge of scrutinizing tiny details in birds. I prefer species that are easy to identify and have very distinct markings of their own. I get bored with picking out a difficult to identify gull or trying to tell the difference between a Western and Eastern whatever look-a-like. However, if there are other birders around who are into that stuff then I'll be glad to listen to their identification pointers and let them do the work for me. Brand of binoculars-3: I used to hear a lot about top of the line binoculars but the cheaper binoculars have gotten better so I don't hear much talk about this binocular versus that binocular much anymore. Reporting Rare Birds-4: I generally only report a bird it if I think it is truly rare or uncommon in a specific area. If I don't have a photo of it or feel that it's unlikely to be relocated I might just let it go because I don't want to be bothered with the scrutiny. Sometimes I just use e-bird. Bird photography-7 : I don't know how to properly use the settings on a camera and don't like the challenge of using one. I just want results. When I see photographers I sometimes ask them for advice. If it weren't for the fact that I need bird photos for this blog then I don't know if I would bother using one. Elitist Birders-5: On many occasions I've heard complaints about elitist birders. I don't really know who they are or really care but I'm sometimes amused by some of the stories I hear. 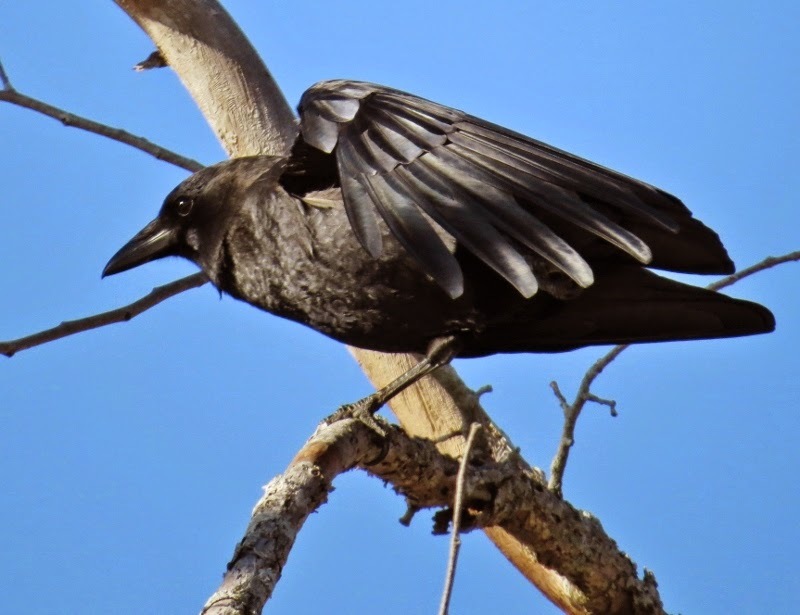 Dishonest Birders-2 : Obviously it's wrong to make false reports about bird sightings and it makes me curious as to why someone would do such a thing. I don't really get fired up about the topic. The idea that those who are suspected of such an act are shunned from the birding community for life is more interesting than the act itself. So there you have it. My ratings of random birding topics. Are any of these hot button topics for you or do you have one of your own? I was out with all the birders on Black Friday. It was mayhem today. Birders were lined up in sleeping bags waiting for the locked gates to open at all the state parks. As an incentive crows were available for viewing at no cost. Birders were sword fighting with tripods and scopes trying to be the first one to get a free look at the crows! 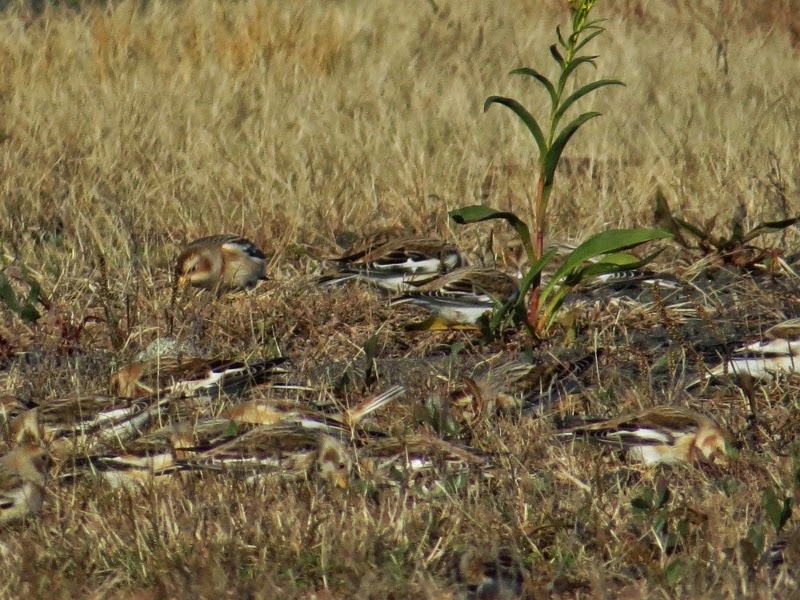 At Hammonasset Snow Buntings were 50% off! There was only about 50-100 of them so they went fast. Please don't mock me mockingbird for taking part in Black Friday Birding. Even birders can't resist a good deal! I generally tolerate cold weather fairly well but I was not ready for the sudden shock of temperatures in the 20's when I first walked out the door on Saturday. A persistent breeze made it even colder. I consulted with my car and we made an executive decision that it was going to be a birding-by-car-only day. We started out at the Durham Meadows near the fairgrounds. I believe the area is called White Farm. There is a long line of dead tree snags that you can pull your car up to in case a bird lands to perch on one of them. It seemed like a good idea but the only birds that landed on them were starlings. They may not win and popularity contests but they are sort of pretty this time of year. The white spots on their breast are a forecast that snow will soon be on its way. I caught a few waxwings chomping on some berries. they say that these birds sometimes become intoxicated by some of the berries they eat. I've found that it has been a good year for kestrels in the local fields that I visit. This one was high up in a giant evergreen near the Durham fairgrounds entrance. I stopped by a skating pond along route 68 which is off of 16 in Durham. 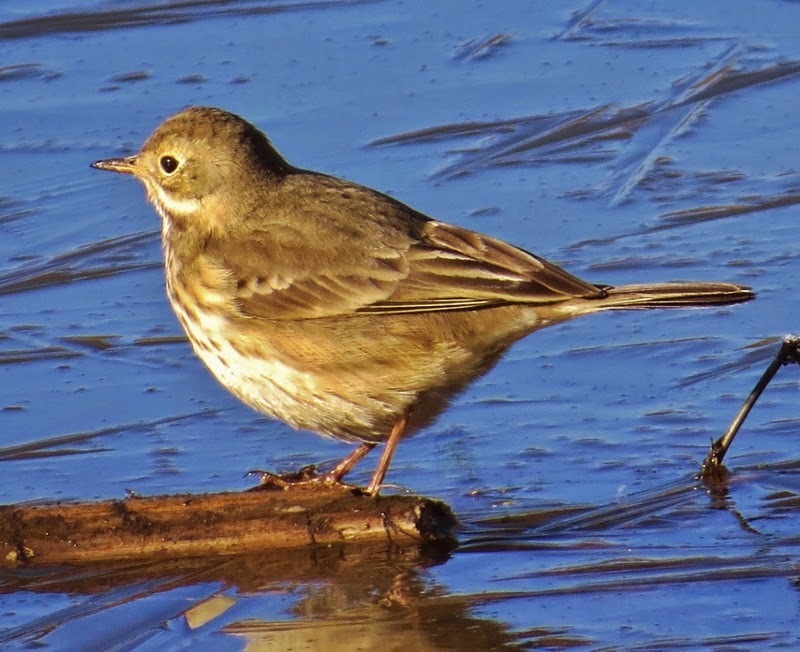 At first, it looked like nothing was around but then I noticed several American Pipits working their way across the pond picking out bits of food from the weedy debris sticking up through the ice. 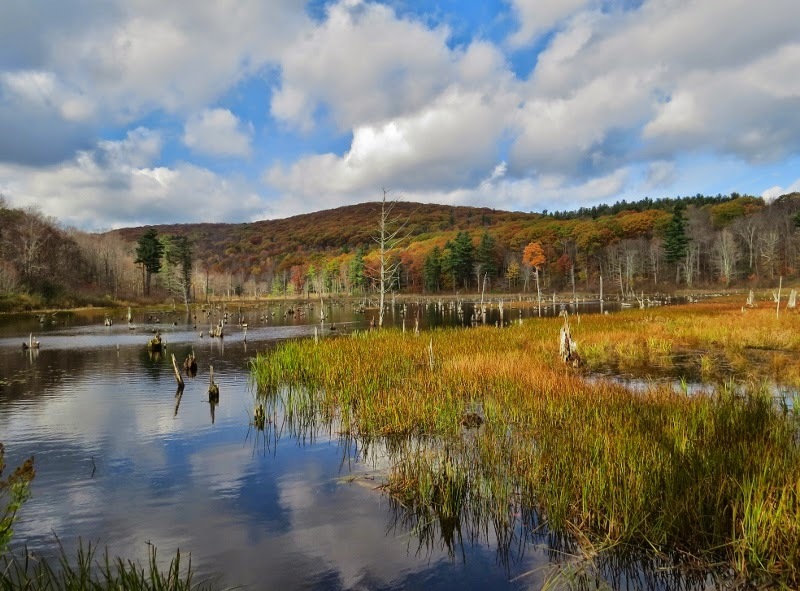 There are a whole circuit of ponds off of route 68 between Durham,Wallingford, and Meriden. 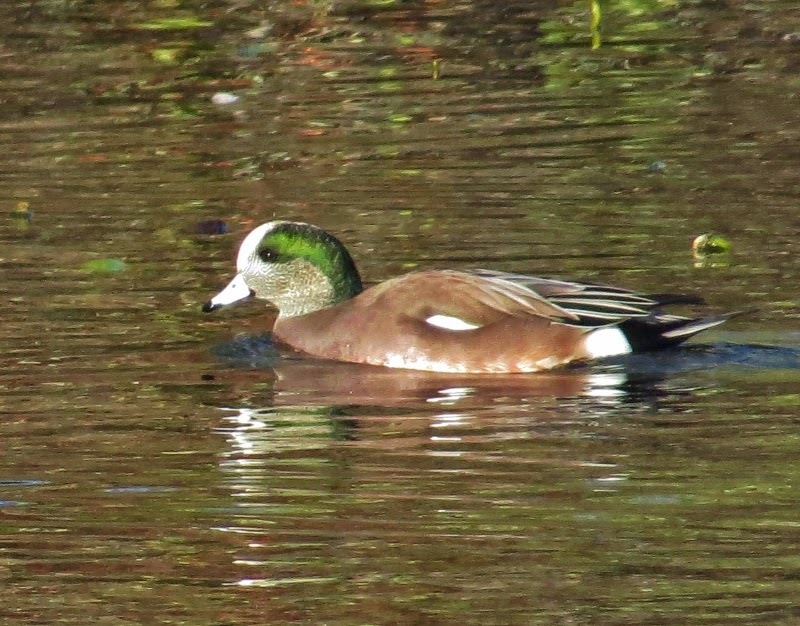 Besides the American Wigeon in the photo I found Buffleheads, American Coot, Hooded Mergansers, Green-winged Teal and lots of other good stuff. Of course, I'm not going to stay in my car all winter. It's not as good as being out in the field enjoying the great outdoors but birding by car can be a good option when you're dealing with wicked windy winter weather. Can You Recall Individual Bird Sightings? I was standing at a field near the Portland fairgrounds when I heard a shotgun blast nearby. I was thinking about how I had carelessly forgotten to bring my orange vest with me. Seconds later, a fairly large bird glided into the tall grass in the field just in front of me. Something about the way the bird came in for a landing struck me as different. 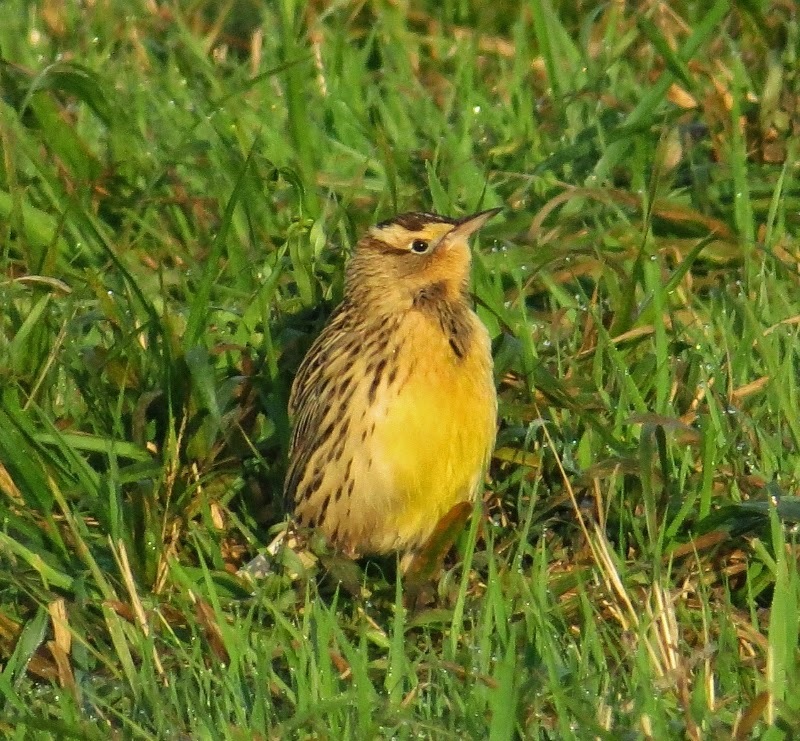 When it emerged from the tall grass I recognized it as a meadowlark. At first I saw it from the back, flicking its tail and showing off white outer tail feathers. Eventually it turned to face me and showed off its bright yellow breast. It was a memorable moment for me because I've only seen half a dozen meadowlarks since I started birding and it was in my hometown. It got me to thinking-I wonder how many individual birds I've seen over the years I can remember? What kind of details surrounding those sightings can I recall? It's easy to remember details of rarer birds I've seen or chased after but what about some random House Sparrow I saw 5 years ago? Probably not so much. 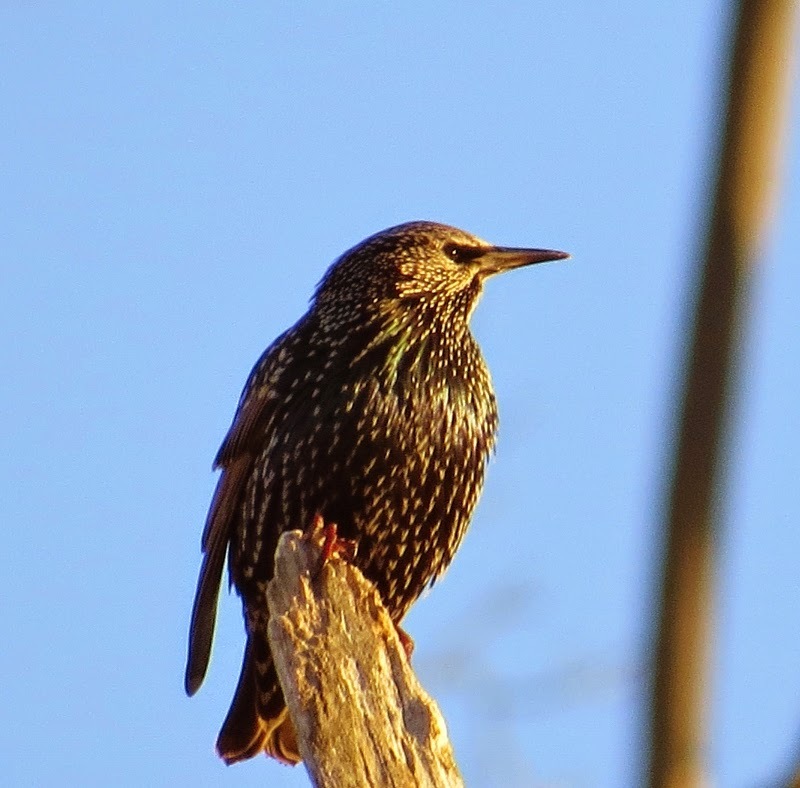 I believe taking photos of a bird helps imprint memories into our mind. I was parked next to a pond in the middle of a roadway leading to Meig's Point at Hammonasset when I took this photo. 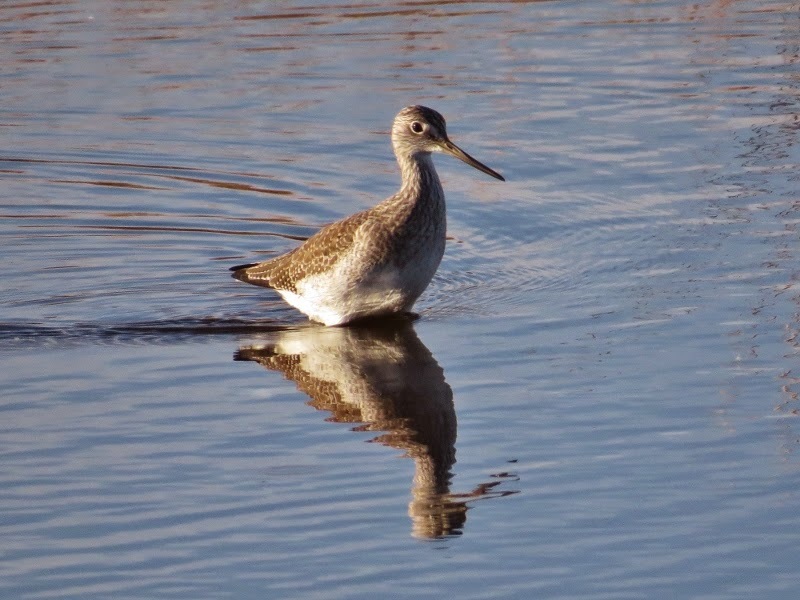 I remembered reading that Greater yellowlegs have a slightly upturned bill noticeably longer than their head. It was also darting quickly through the water chasing after food, which is another habit of theirs. 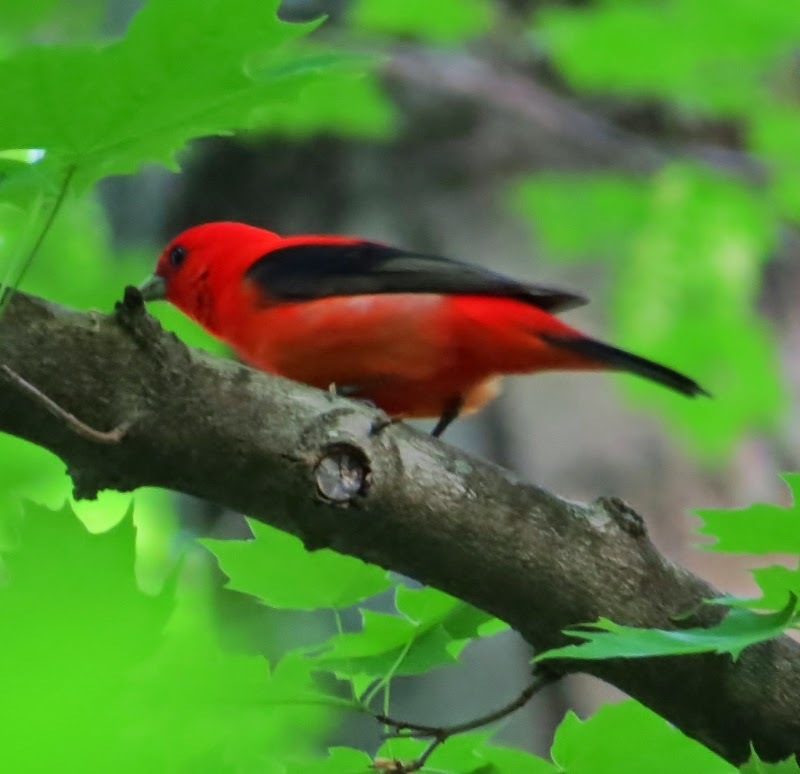 I saw this Scarlet Tanager one early summer morning. I was excited that it landed in a branch just above my head but disappointed that there wasn't much light. I wouldn't be able to take a picture that could match what I had seen with my own eyes. 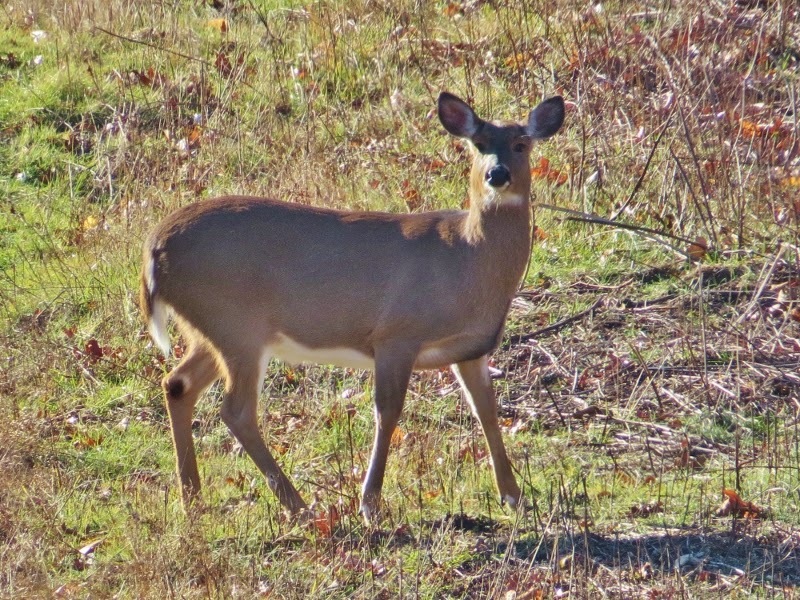 I was zipping along a back road when I saw a large form out of the corner of my eye. I shifted into reverse with my emergency flashers on and pulled up close to the woods to get a photo. My car was facing oncoming traffic. Birders are not the greatest drivers when they're in birder mode. 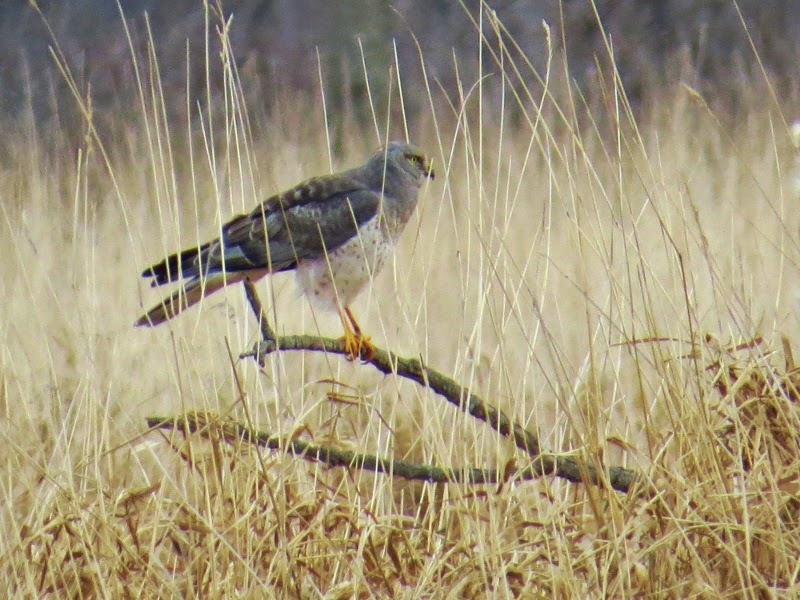 I got out of the car and the hawk still didn't move! I took a dozen pictures of it but never could get the right lighting. Lyman's orchards was swarming with crows on this day and I'll bet I was the subject of their conversation when I showed up to spoil their party.Their weren't many ducks in the pond that day but the cider was pretty good. It may seem routine at times as we wander about searching for birds to identify but there's great deal of concentration involved with birding. I'll bet there is a lot more information about bird sightings in our memory banks than we are consciously aware of. I forget where I put my car keys but I can remember a brilliant red male cardinal perched in the middle of a snow-covered bush during a Christmas count from 5 years ago. 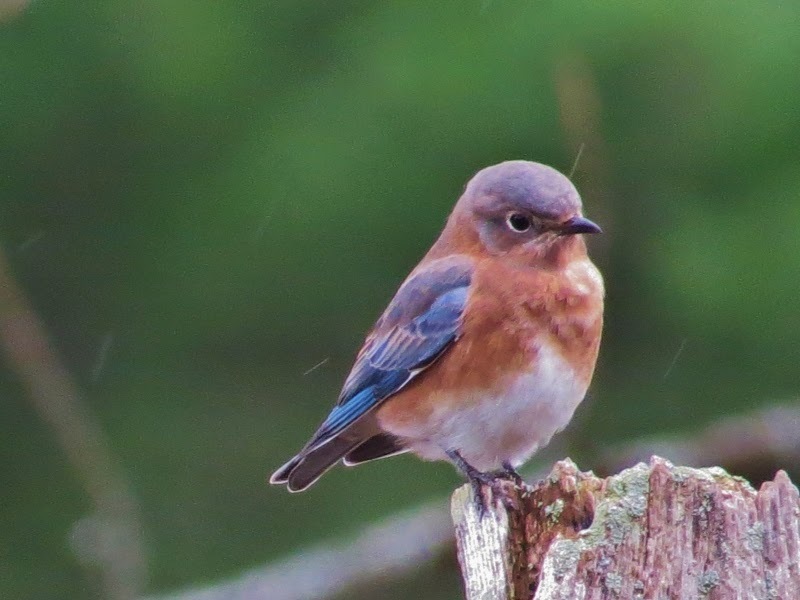 I remember exactly where I was standing on a path along the Connecticut River when I saw my first bluebird. I even remember specific sightings of less glamorous birds like House Sparrows and House Finches. I know of one veteran birder who can tell you the date of first-of year birds he saw from the 1960's! Try searching your own bird-memory bank. I'll bet you might surprise yourself with memories of specific birds and the details surrounding those particular sightings. 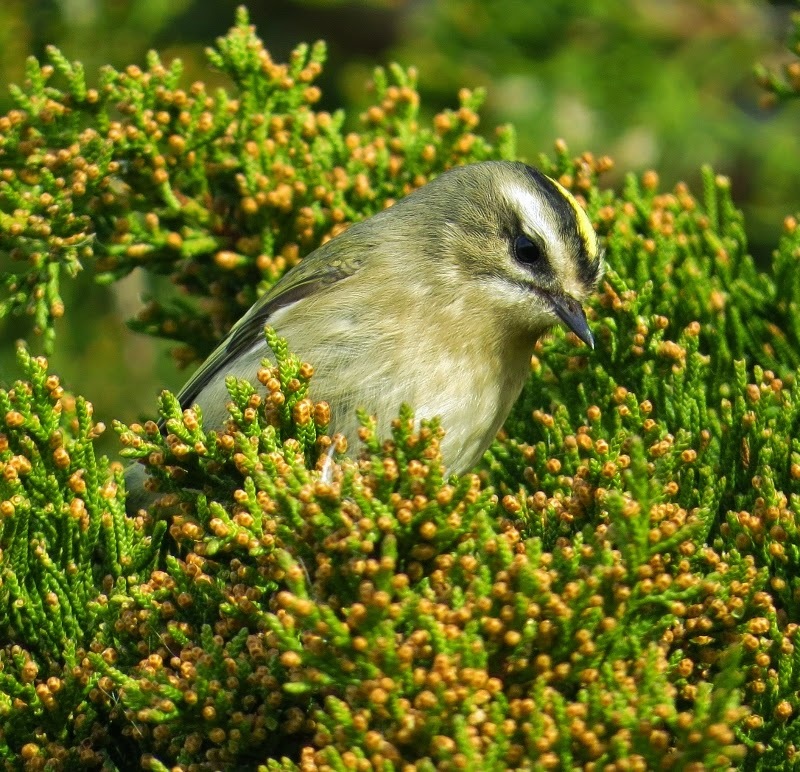 I was in the midst of birding along the shoreline when I came across a cedar tree with several Golden-crowned Kinglets fluttering from the branches as they searched for food. Up until this point my unofficial objective was to look for a variety of sparrows and keep my eye out for certain species of birds that had been reported in the area. After several minutes of viewing I realized that these kinglets weren't going anywhere soon which presented me with an opportunity to observe them more closely. 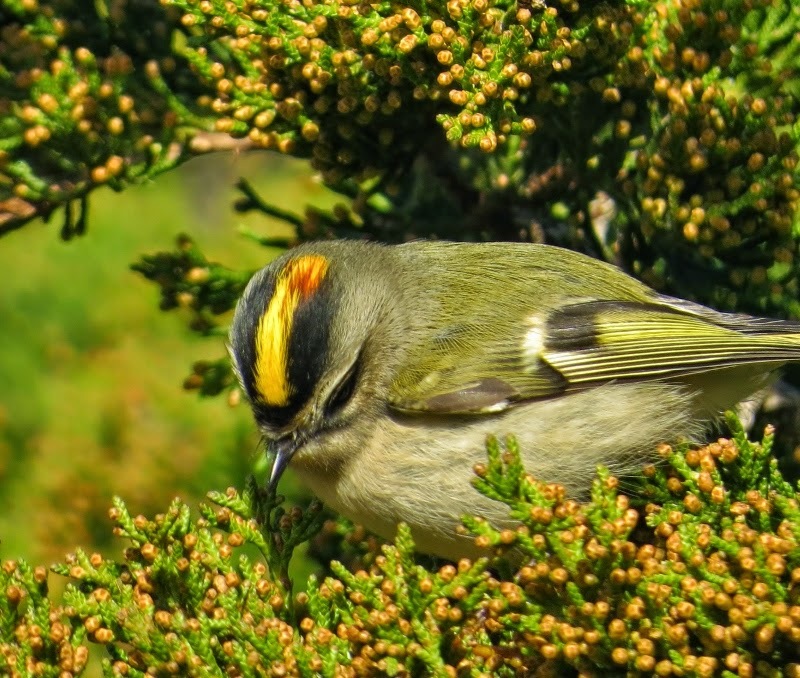 Golden-crowned Kinglets are a tiny bird with beautiful markings, especially their golden crown which is outlined in black.They mainly eat tiny insects and can survive in 40 degree below zero temperatures. 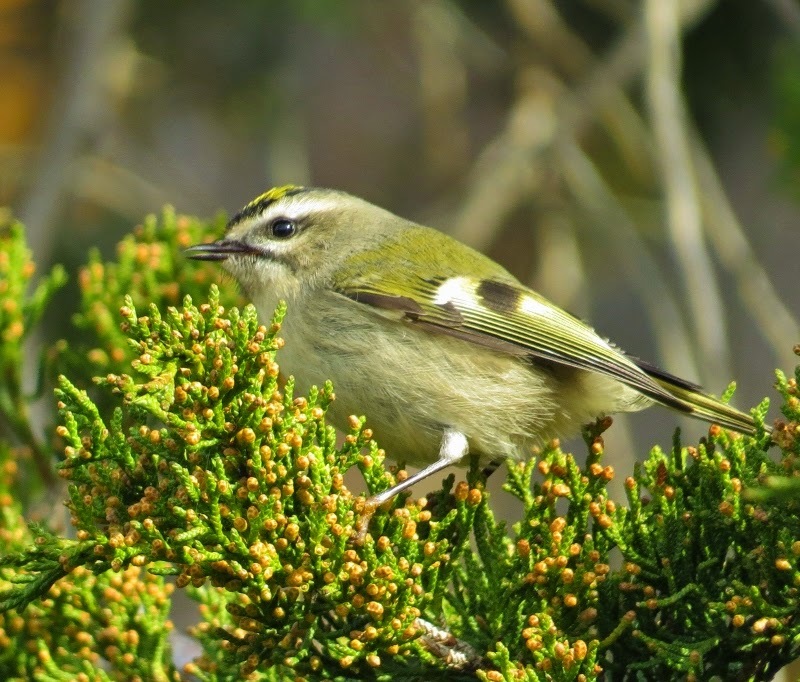 It's not uncommon to find Golden-crowned Kinglets in Connecticut, especially this time of year. One of the things which frustrates me about them is that they move around so frequently that I find it difficult to photograph them. Usually, I end up with an out-of-focus photo showing blurred wings with the bird in an awkward pose. This time, I was able to follow their movement pattern until I was finally able to catch a few in the proper position. I spent an hour standing in front of the same tree but it was worth it to me. 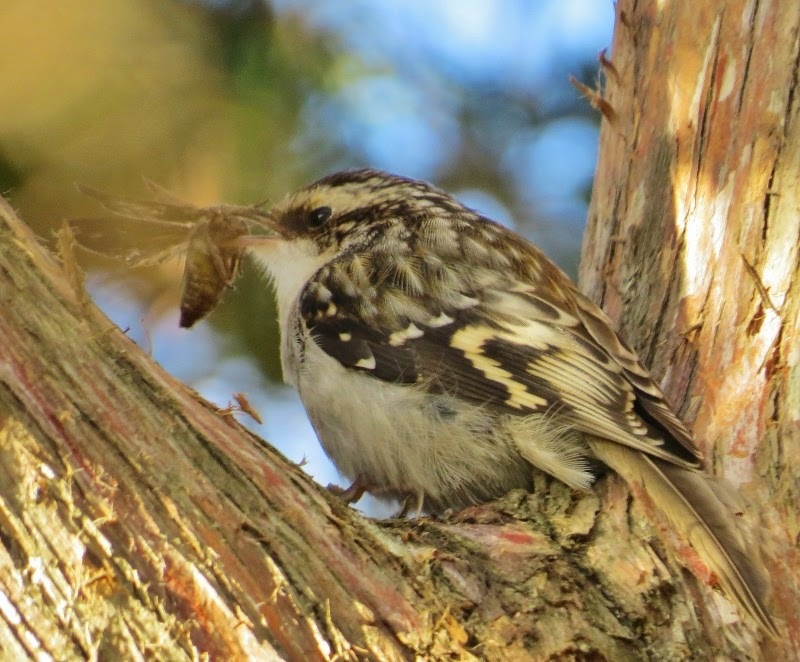 A Brown Creeper also came in to visit the same tree. They usually blend in with the color of the tree bark making them difficult to see. Catching one in this position with a mouthful of food was a pleasant surprise. 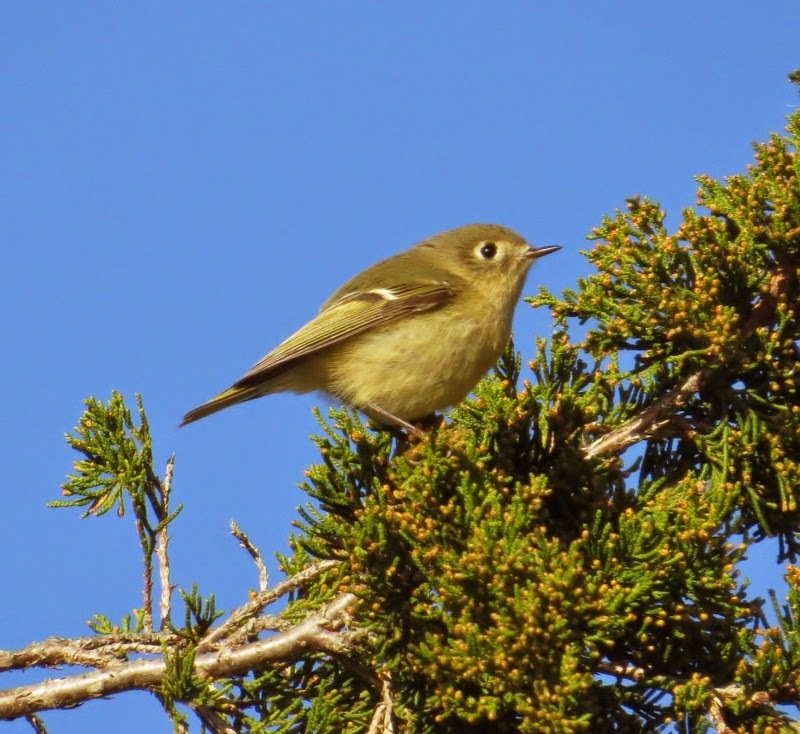 There were also several Ruby-crowned Kinglets in the area that day as well. Trying to catch one with its crown raised is a challenge for another day or maybe even another year. I usually have some sort of plan when I'm out birding but I think it's important to be aware of special opportunities when they present themselves. There may be a limit to the number of birds you can see but the variety in which you can appreciate the world of nature is limited only by your imagination. 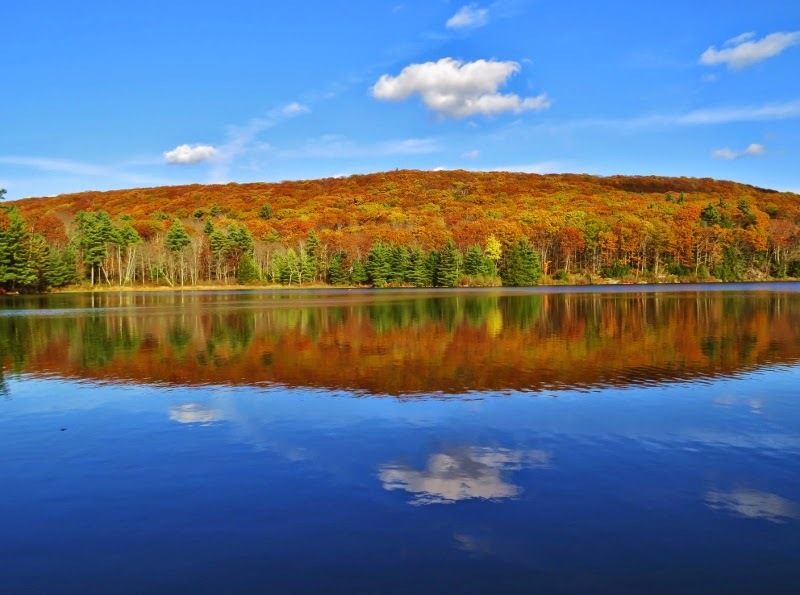 This was the view from my lakeside tent site in the Berkshires. There are only 12 total sites at this particular state campsite. I chose it because walk-in only camping is available here during the off-season. I prefer walk-in camping when using a tent so that you can time your arrival with a suitable weather forecast. The park has become much more popular through word of mouth since I last visited it some years ago so I don't want to reveal its location. I'll just say that it rhymes with peartown. Some of the other campers wondered how I was able to get the best tent site (11) which is only one of 2 directly on the pond. I went up on a Friday morning while it was still raining to claim the site. I spent the day birdwatching in between the rain drops and set up my tent in the afternoon after the rain had stopped. 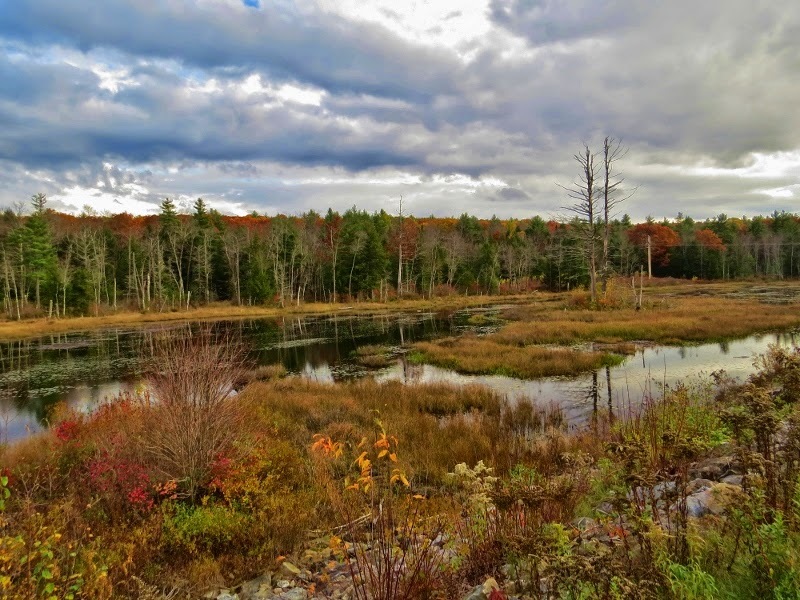 I walked a few miles along the state forest road searching for interesting habitat. I found this solitary Hooded Merganser on the water and had to think twice about what it was. 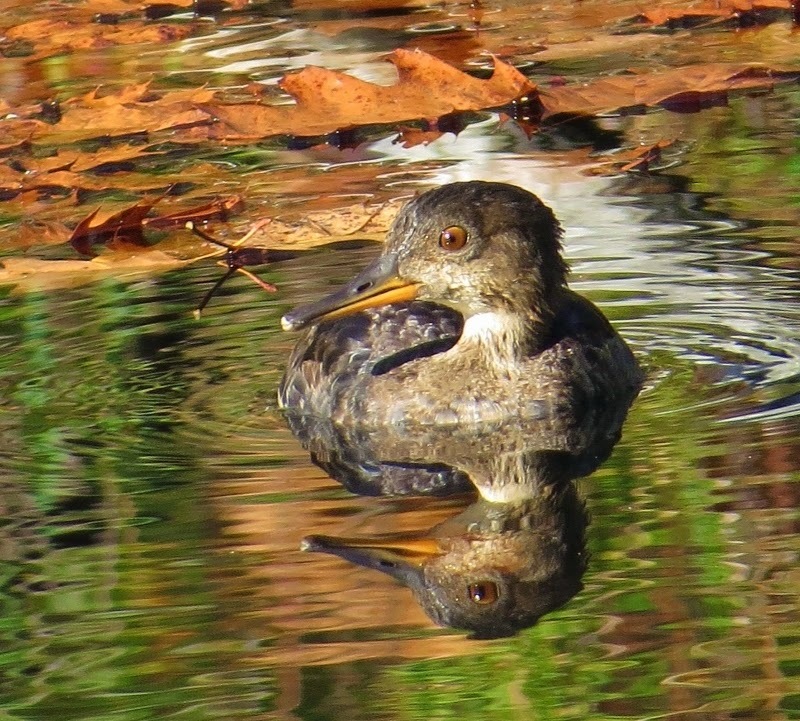 I'm not used to seeing juvenile Hooded Mergansers without any of their tell-tale markings. 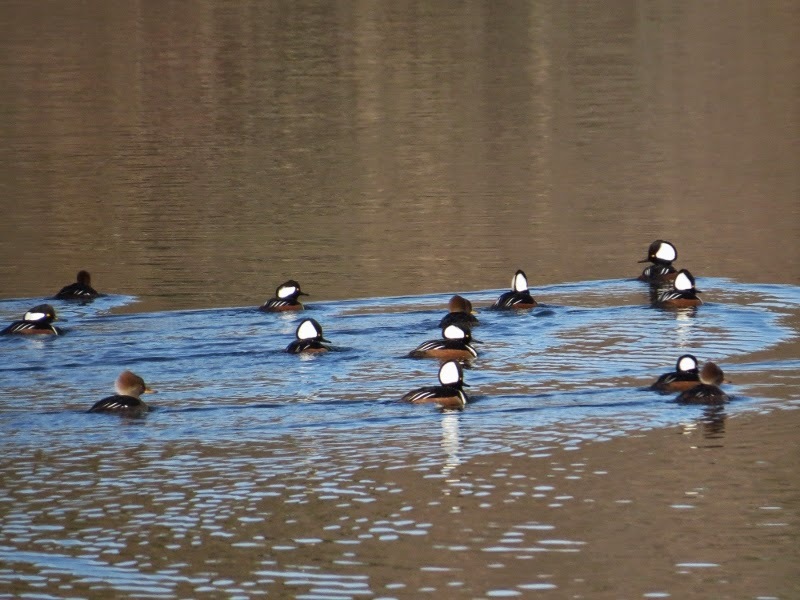 I also found some adult Hooded Mergansers on my way home. I find that I enjoy birding a lot while I'm on a camping trip. You're already in the nature mindset and have nothing other to worry about except for eating and making a campfire! Note: One of the things I find helpful when going camping in an unfamiliar place is to use e-bird to find places in the area which have had sightings of species that I would like to see under the "explore data" section. I also e-mail local audubon or bird clubs for information. 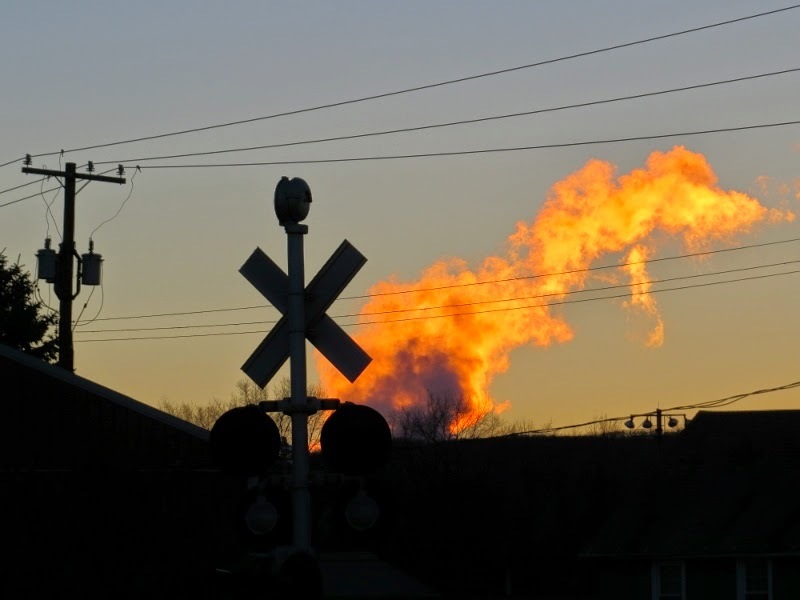 A few family members took an October day trip up to a small town in New Hamphire. 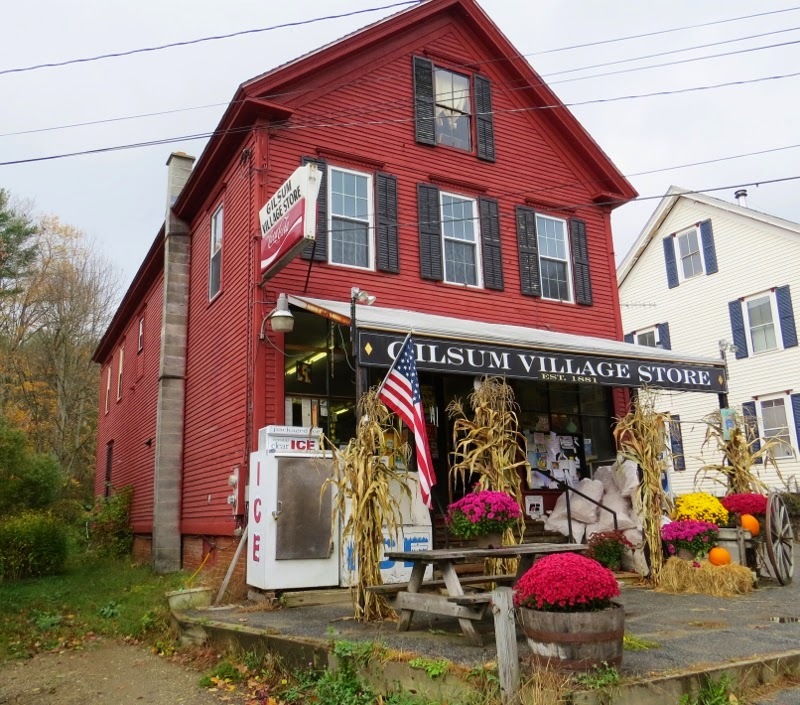 Gilsum has a population of about 800 and you can tell by looking at this picture of the town mall that the town hasn't changed much over the years. 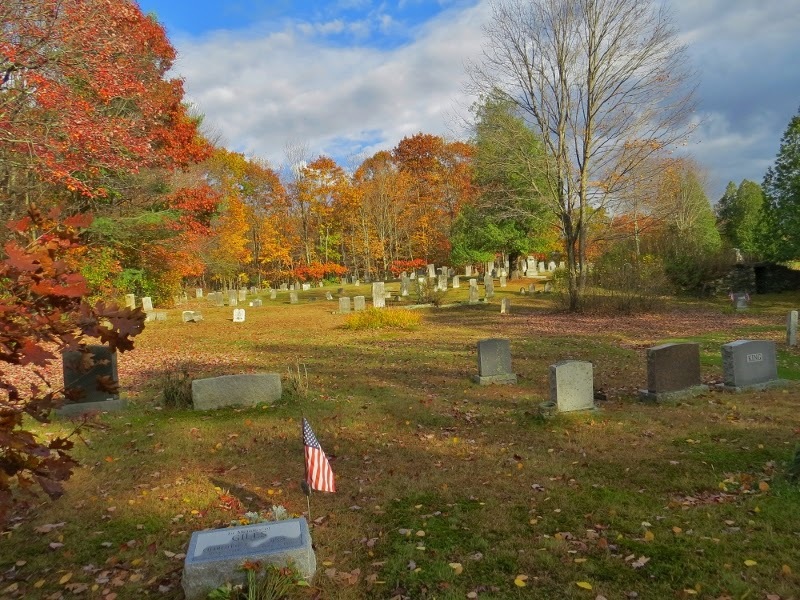 We visited a small cemetery and were able to find several relatives dating back to the 1800's buried here with old-fashioned first names like Wendell, Kendell, and Bertha. I attended a big family reunion back in the early 70's that took place on a big farm. The house on that farm is over 200 years old. It has been passed on to family members through the years. 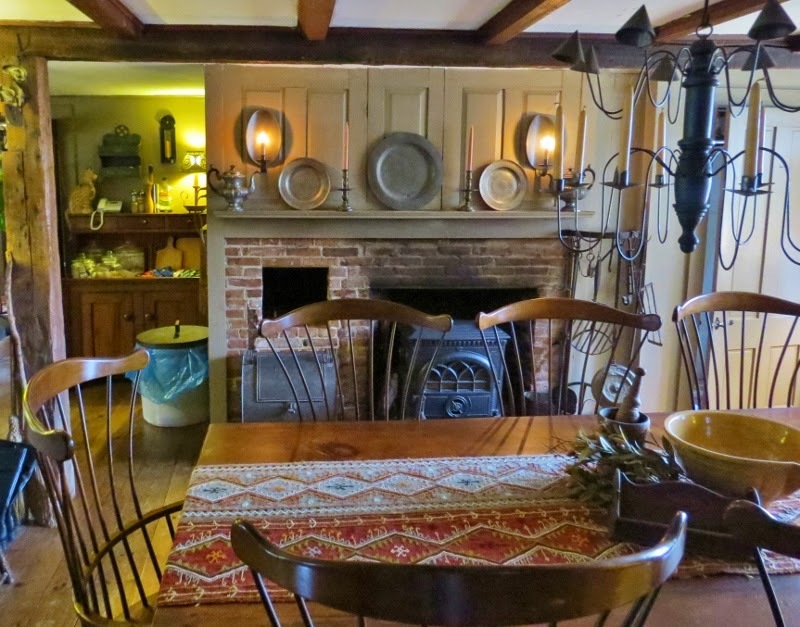 It was a thrill to go back and see this historic home which has so much character. It was so interesting to meet our relatives who now own this house and we were able to learn a lot about our family history.They even had a picture of the family tree with our names listed on one of the branches! 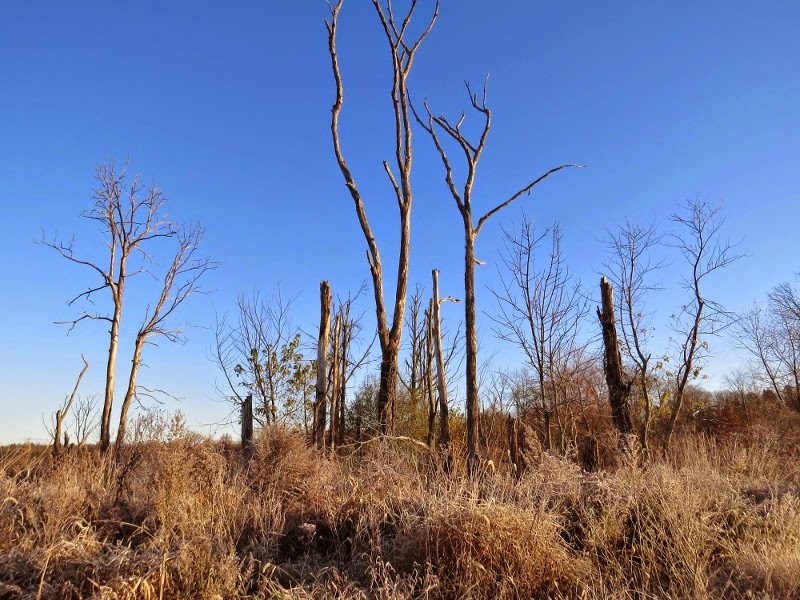 There was a lot of swampy habitat in the area including that shown in the photo above. 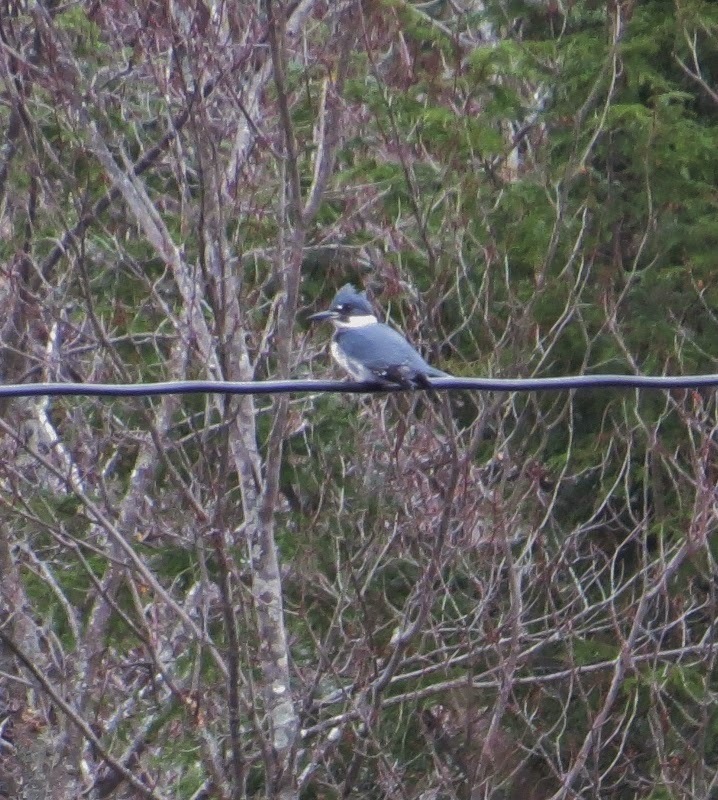 I found a Belted Kingfisher way off in the distance. 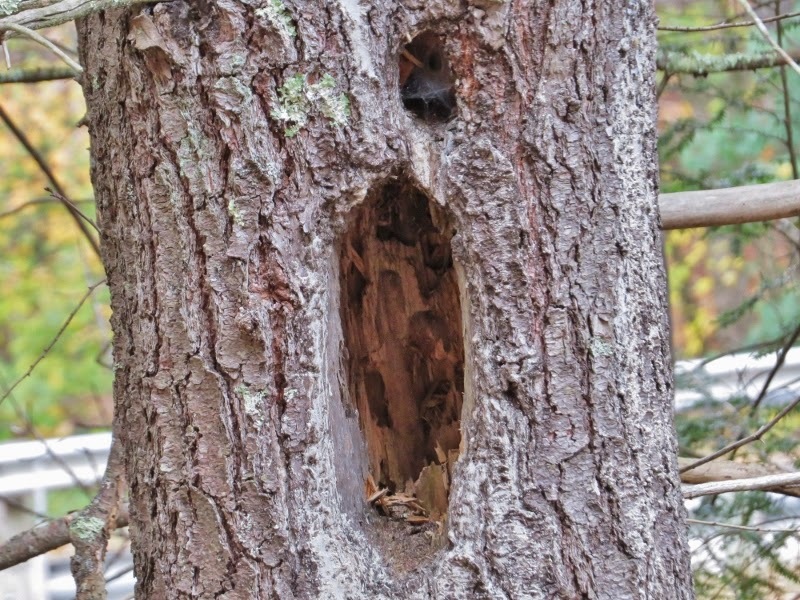 The hole in this tree looks like the work of a Pileated Woodpecker. There was one of those times when I put birding on the back burner for the day but it was well worth the sacrifice. 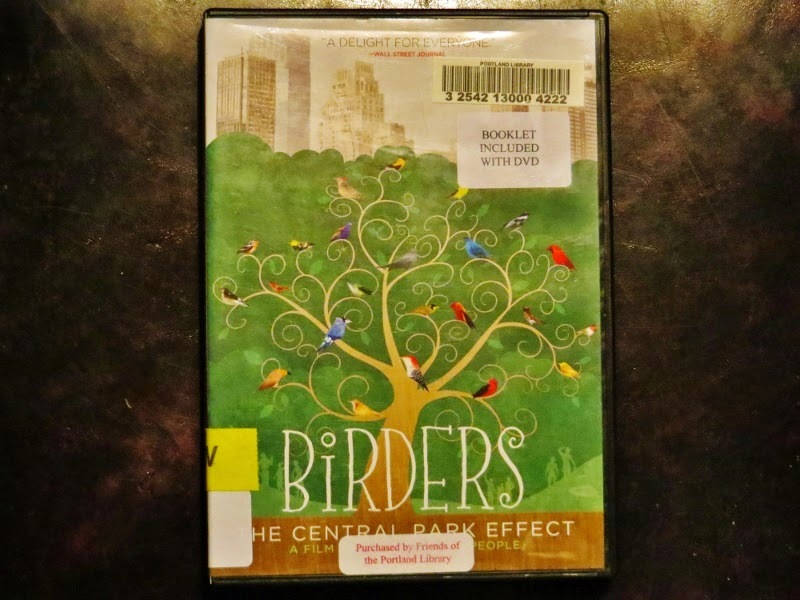 I just took out a copy of Birders: The Central Park Effect (HBO) from the local library and watched it for the first time.This is the third movie I've seen about birding but the first one which features real birders. It's a documentary that interviews birders while they are birding in central park throughout the movie. 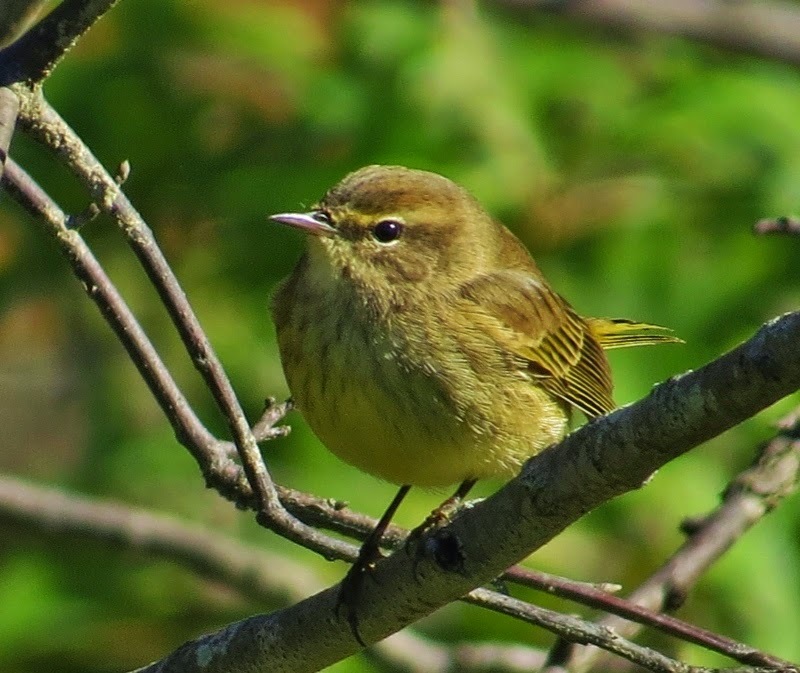 The interviewees give their insight about what it is that makes birding so great. It also has fantastic footage of the brilliantly colored migrants as birders zero in on them with their binoculars. This movie was a great reminder of what I like so much about birding and almost made me feel as if I were on a field trip in Central Park. What made it more interesting was that I recognized some of the birders in the movie. It has put Central Park on the list of places I need to visit during the spring. Non-birders watching this movie should also gain a greater understanding of what the appeal of birding is all about. (I noticed that this DVD can be purchased or rented on some of the popular online retailers). 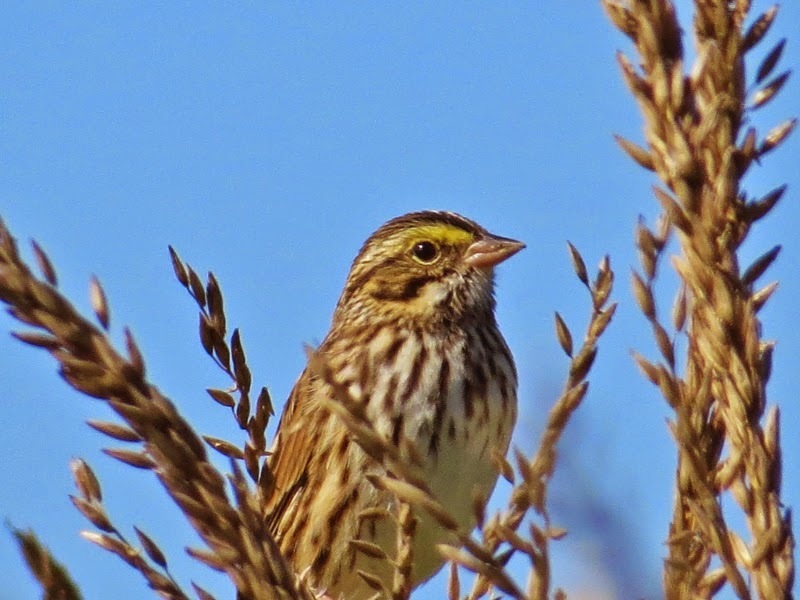 I made a visit to my local patch at Wangunk Meadows this weekend to check on the state of the sparrows and other birds. I walked along the river past the fairgrounds to the northern end of Wangunk. 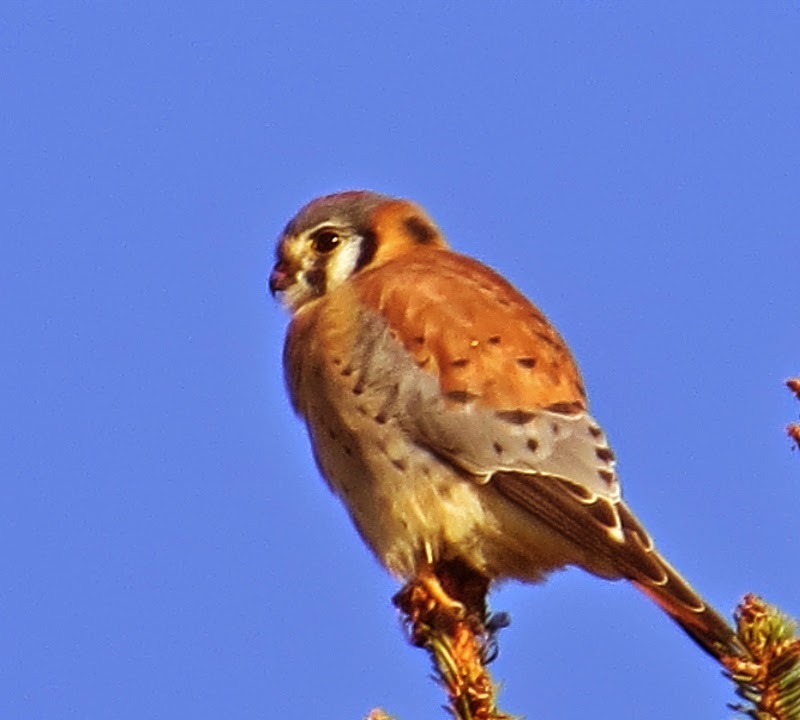 Along the way I counted 8 Swamp Sparrows, 12 Eastern Bluebirds, 4 White-throated Sparrows, 2 Red-shouldered Hawks, 2 Bald Eagles,1 Northern Harrier, 2 Osprey, 1 Sharp-shinned Hawk, and 1 American kestrel. I saw about 35 species in total. 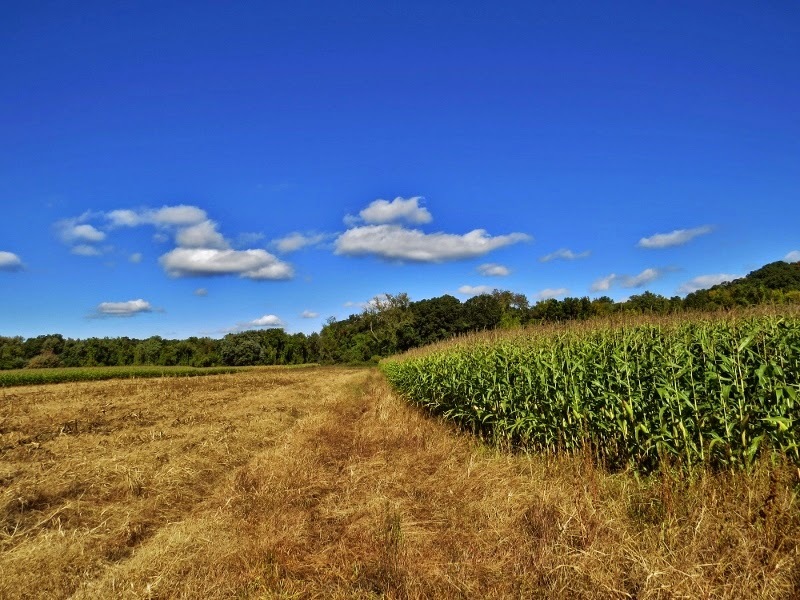 You might not know it by looking at this picture but I counted at least 40 Savannah Sparrows near these cornfields. They were very hard to see on the ground and when I got close they would pop up into the cornfields and disappear. I finally managed to catch one at the top of a corn plant looking around. When I was in the deepest part of the woods, 2 Alaskan Huskies ran toward me. I pet one of the dogs but the second dog didn't like it. A dog argument broke out and I was standing between 2 alpha males aggressively barking, snarling, and baring teeth. I like dogs but I was a wee bit nervous there for a minute. Sparrows of the corn, surrounded by birds of prey, and being cornered by angry dogs made the morning feel like an early Halloween birding trip. Hummingbirds Are Arriving Are You Ready? 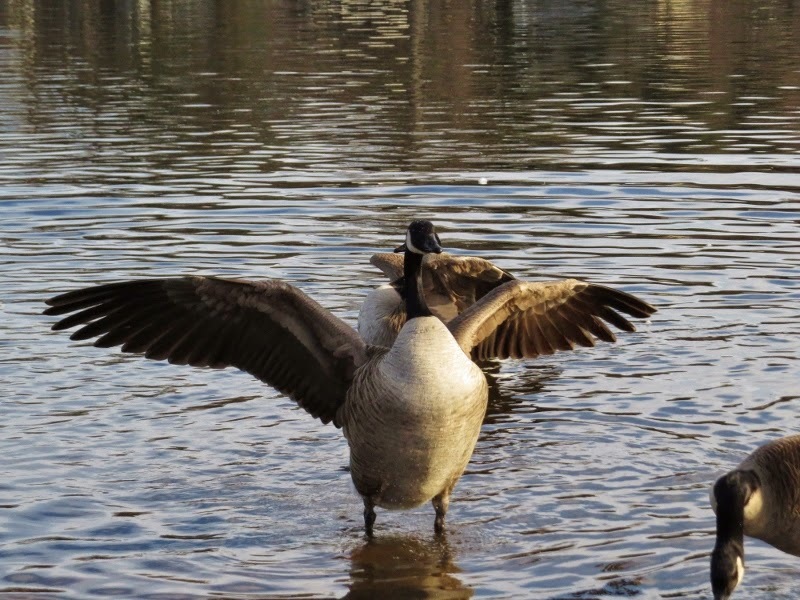 Cackling Goose Study at Van Cortlandt Park Bronx Co.
Commentary: What Do YOU Want Middletown To Be?